Sometimes I get this resplendent feeling. It starts in the pit of my stomach. I can feel it pressing against my ribs and radiating out of my finger tips. A coniferous forest rises up around me. It’s symphonic. These trees, they aren’t rising, they’re shooting up, dwarfing me. The canopy is closing rapidly, and the rays of sunlight are reduced to pinholes. Scarab beetles and snowshoe rabbits conspire in the underbrush. There is music here. A primal composition of every song ever written. Every blip, every snare, every haunting a capella. It’s played on quantum strings. It’s the vibration of the very fabric of reality and so lovely. The streets and houses that were once around me have disintegrated and the milky way runs like a creek through the forest. There are faeries and strange little people with giant gems for eyes that I don’t entirely trust but seem to know ancient things about pain suppression. Magical beasts and deities, many armed and fire breathing, play dice. There is math here and neurons too. There is no time. The universe and all it contains are one moment, one substance in this forest. I have no body, no fingers or toes or little belly. I’m not afraid to die or fall out of love or be mediocre. Those concepts don’t even make sense. My heart feels swollen in my chest. I feel majestic, but the tick-tock of a blinker intrudes. Headlights. I’m driving. I’m driving a pick-up truck. I’m driving a pick-up truck because he moved in with me this weekend, moved in with his stacks of books and antique furniture and a piece of obsidian. I’m driving a pick-up truck back home, now our home, from Walgreens. It’s midnight. I bought a pint of cookies & cream for $1.29. We’re going to share it in bed and watch our favorite television show. The forest is gone, and I’m mortal again. And then, as my street comes back into focus, for a moment I feel as if I’ll become untethered and be flung clear off the face of the earth, a special case that gravity capriciously forsook. It doesn’t happen. I stay planted. We eat ice cream in bed. But you see, sometimes I lose my gravity. In a moment all of reality ripples and shimmers as if it were about to dissipate entirely, and then, just as quickly, it solidifies back into lawn, mailbox, ceiling fan, spoon. This phenomena, if you will, is one of the many reasons I love to cook & bake. For me, baking pie is, in a sense, like holding on to clumps of dirt for dear life. It’s real. I’m real. You’re real. He & I are real, and I don’t need to be afraid. And as I slice into ripe fruit, as flour mushrooms out of the bag into my mixing bowl, as I shred basil leaves with my fingers, I am here, and it is now. I realize that the season for peaches has all but passed like a sigh, but I made these in August and wanted to share them with you. If you’re quick you might be able to grab the last peaches of the season depending on where you live. And this was not the last summer on earth, unless of course you believe that this world will end come December, so when the market stalls are brimming with peaches again next summer, you’ll be glad to have this recipe tucked into your apron. Or back pocket. Or hat. Or wherever you do your tucking. I tuck my recipes into an old symbolic logic notebook. I don’t even wear an apron. I just mess up my clothes all the time. It’s senseless. The rose water in this pie filling compliments the floral notes of the white peaches and adds that certain je ne sais quoi that makes a dish feel special. It should be noted you can certainly use yellow peaches. Nectarines would be nice too. This can be easily adapted to make a full sized pie, just slice the peaches instead of dice them. While I’ve given measurements below, I usually just add the rose and honey to taste along with a healthy handful of basil. I often make it as a galette for a quick & easy dessert for impromptu dinner guests with dough I keep on hand in the freezer. Try it with some homemade cardamom ice cream & candied almonds. You’ll just die. It’s so good. Mix all of the ingredients except the cornstarch in a bowl. Adjust taste to your liking. Let sit 15 minutes to allow the flavors to meld. Pour off about a tablspoon of the liquid in the bottom and mix with the cornstarch. Stir this back into the peaches. Generously flour your work surface. Place one chilled, unwrapped dough on the flour and flour the top of the dough. Keep the other disk refrigerated while you work. Gently roll your dough out from the center until about 1/8 inch thick. Re-flour your surface as needed, continually lifting and rotating your dough to make sure no parts are sticking. If the dough becomes difficult to work with at any point, chill for a few minutes in the freezer on a baking sheet before continuing. Line a baking sheet with parchment paper. Cut an even number of circles in desired size using a floured biscuit cutter or the base of a small bowl. (I made 4″ pies using a scalloped biscuit cutter.) Lay circles on parchment lined baking sheet. Chill dough if getting too soft for a few minutes in the fridge or freezer before continuing. I find myself popping them in and out of the freezer as needed while I work if they start getting gooey. Fill a small bowl with cold water and keep it near by. Top half the circles with a small amount of filling, about 1 Tbsp for 4″ pies and about 1 tsp if making bite sized 2″ pies. Using your finger lightly wet the bottom half with the water, top with another round, and seal edges by pressing gently but firmly to seal. You can also use a fork to seal them. Brush top with egg wash, sprinkle with raw sugar, and cut to vent. When completed place in the refrigerator to chill and repeat with other disc of dough and remaining filling. When second sheet of pies are formed, put in fridge and remove the first sheet. Bake for 5 minutes at 425° F and then reduce the temperature to 350° F and bake 10-15 more minutes until pies are golden brown. Cool on racks. Pies can be stored in air tight containers but are best eaten within 24 hours of baking. 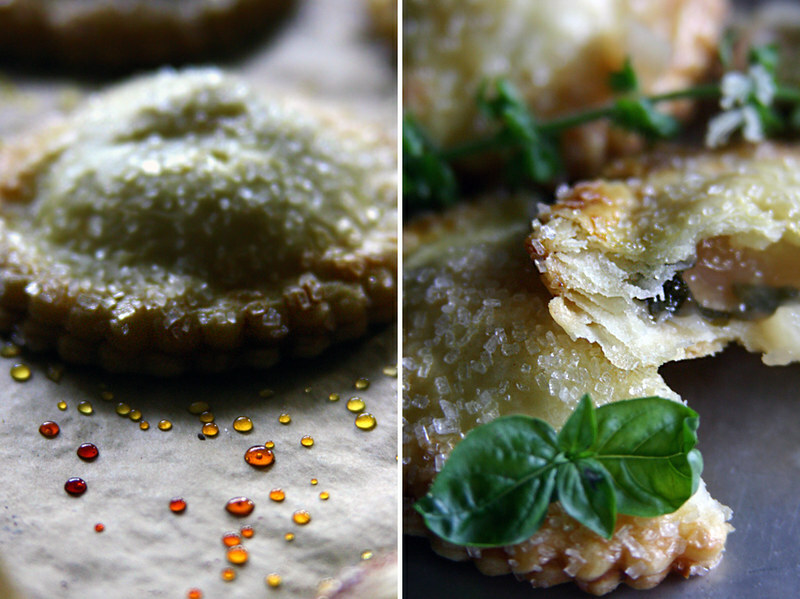 Your ability to make insanely scrumptious and adorable hand pies is both inspiring and frustrating ; ). The shots with the sugar/syrup dots are lovely! Maybe one of these days I’ll make a full sized pie! But I’m always giving them away all over the place… so nice to be able to bag these little friends up! Love. 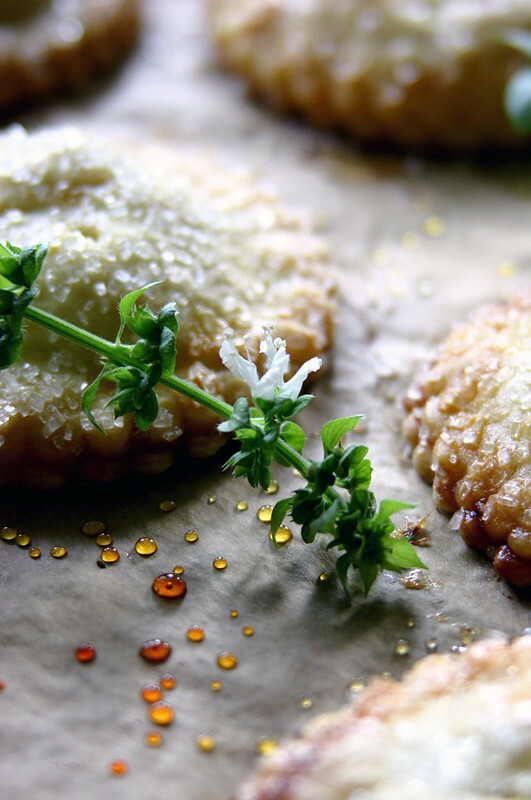 There is something so wonderfully nostalgic about hand pies & I love the combination of flavours in the filling. The basil is such a perfect touch. I basically can’t stop myself from adding something unexpected to my pies. It’s like a twitch. Herbs are a favorite. 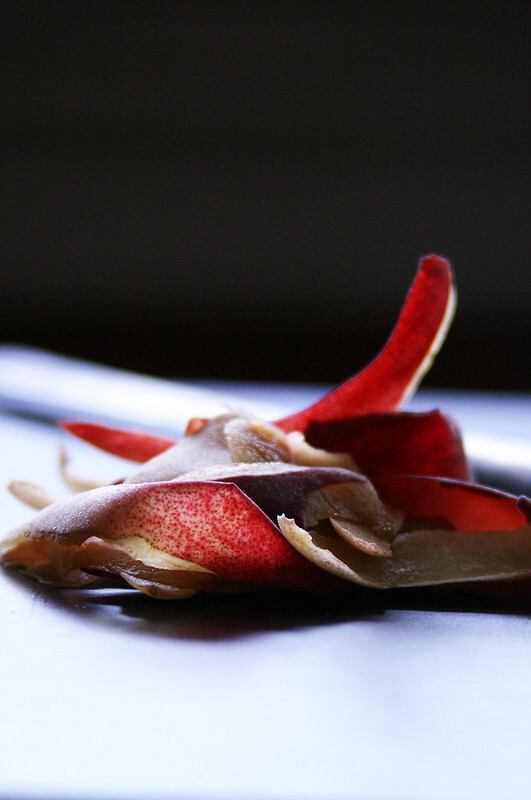 Where would one procure rose water for cooking? Amazing photos of such gorgeous little pies. And I love your “psychedelic ramblings”! Not sure but think I was there with you at the Sunday Suppers a couple few weeks ago. These little pies look so scrumptious. Wait, sorry, and Im a English teacher. Let me rephrase that sentence. “Not sure but think we both attended the same Sunday Suppers work shop a few weeks ago.” Yes indeed, your pies look deliciously scrumptious. I was there! Were you at the baking workshop or the dinner? Love this. I was having the same kinds of thoughts about apples – how they connect me to the earth, to real life. 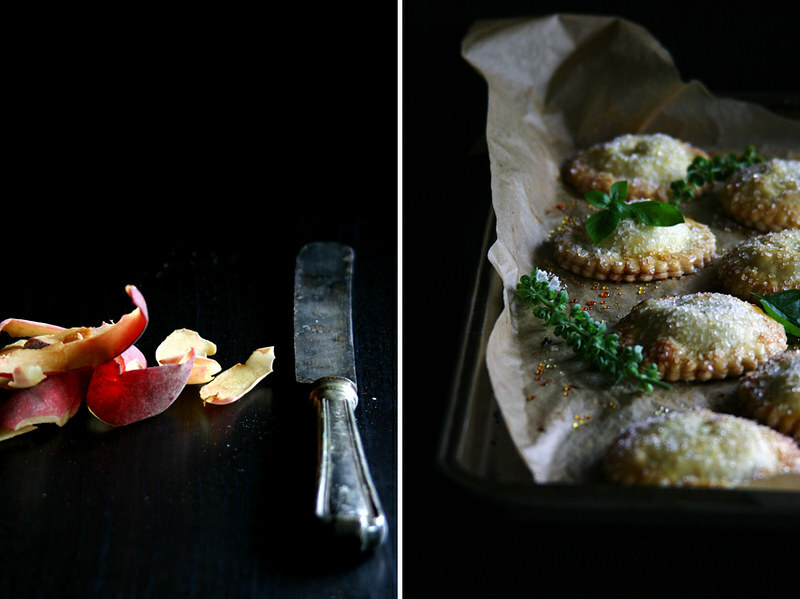 These are possibly the most beautiful little hand pies I’ve ever seen. Am just imagining the wonderful flavours of soft peach, basil and flaky pastry with that crunchy sugar shell – absolutely gorgeous. Your ramblings are fine by me as long as you keep these sweet little pies coming, miss. I’m in the no-apron club too because I find myself spontaneously drawn to the kitchen too often to catch myself and tie it on. Messing up those clothes like it ain’t no thing. That is some messy and righteous living. Man, I feel like my refusal to wear an apron is like some subconscious desire to vex myself. Maybe I’ve just given up & decided I’m going to forever be covered is splatters and flour. I certainly *have* aprons… I even have a Star Wars apron with my name embroidered on it! I have my mother to thank for that pinnacle of nerdiness! I just happen to stumble upon your darling site and ADORE your photos: the texture, the layout, the passion behind the words. I can relate to any intellect-gone-foodie. Food can creep its way into every fiber of our lives and to be able to relate food to cultures and society is something truly unique (especially Southern food!) Lovely! Thank you so much! I always felt torn between the intellectual/poet/artist/cook/baker parts of myself. So I just threw them all into one big pot and here you have it! And Southern food, especially retranslated & imagined as well as preserved is a passion of mine. your photography is just absolutely stunning! WOW! Thanks! I’m still trying to get the hang of it! Very classy looking little pies! I want to try to make them too. Gorgeous photos. I really love them !! Cuantas cosas MARAVILLOSAS, en esta VIDA, para el que las quiera ver… incluidos tus PASTELITOS!!! Achingly beautiful post, love. You make me want to make little pies and wish I had a fellow to share them with. these are just adorable and beautiful at the same time. So glad I came over for a visit. The photography and writing is so captivating! Congratulations. You managed to be even more pretentious than Nigella Lawson. Oh… I felt the same way when the boy and I moved in together. It’s been a wonderful 2 months and I’m sure it’ll be the same for you. Lovely hand pies. I really should make some soon. These are delicate and I’m sure flavorful. 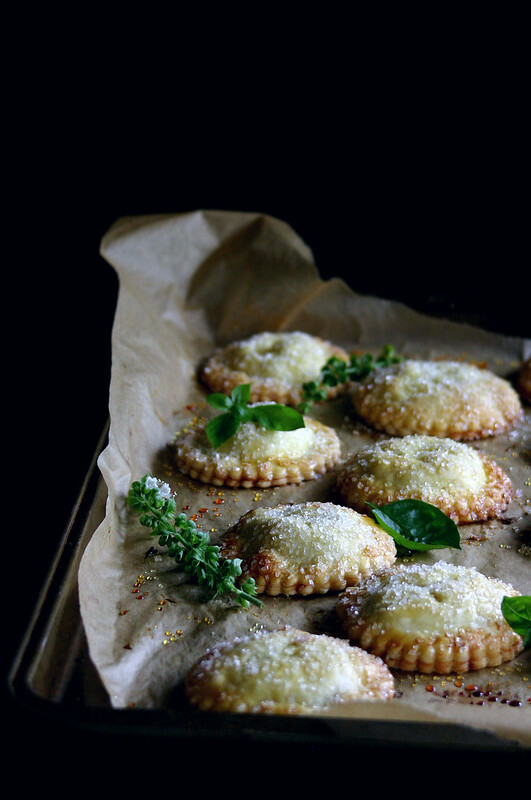 So much better than heavy and greasy store bought hand pies. We’re so excited for this next phase of our lives together… but it’s definitely a transition! and yes, these trounce store bought facsimiles! I’m about to leave on a jetplane to Vietnam with my lover, my relatively new lover… only 8 months in, and your speaking of dirt clods and reality and feeling quite the spark in the forests eye… well, it all sounds particularly resonant right now. I ruin my clothes baking all the time, too. Oh, he’s home! At 4:43 in the morning. 😉 gotta run. And make rosewater peach something in the near future…. That sounds amazing. I live for adventure. In my mind cooking, cameras, writing, travel, aesthetics, and intimacy (corporeal and non) are basically the entirety of my reasons for being. As such… a jaunt to Vietnam with fresh love. Well, that’s as good as it gets. Marvelous, Sensuous, Tantalizingly Delicious ! very much for sharing this with us. If you do, I’d love to know how they turn out! I came here via the Make website, and just had to comment – these look amazing! I can’t wait for peach season to roll around here in the southern hemisphere so I can try these out. I’d love to hear about it if you do try them! I love stone fruits in tarts/pies/galettes/cobblers more than anything else. As to the photos, I’m always practicing… and I must admit I take a *lot* of photos! I’m glad you think it’s eloquent… sometimes I feel like I’m rambling, but language inspires me as much as photographs and food. These are so pretty. 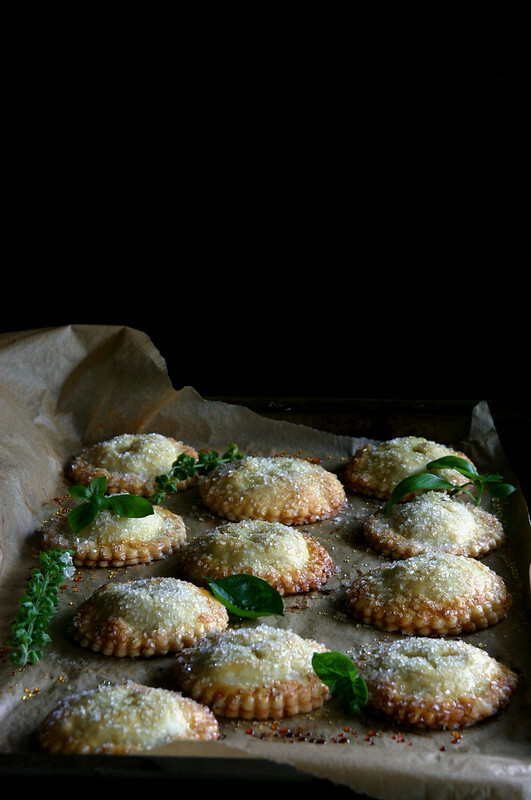 I make hand pies a lot, and I love the basil here. hi! i baked the pies. they were to die for!!! absolutely delicious. well worth the calories. However, i could not achieve the distinct scallop edges. could someone advice please? 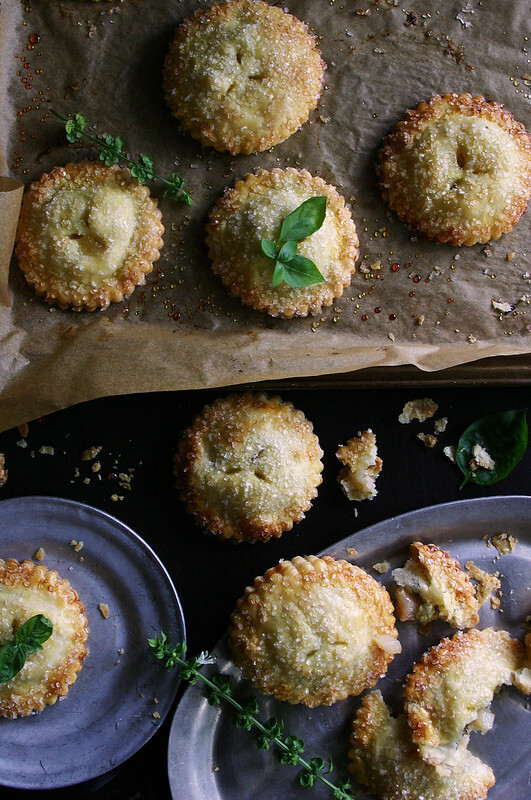 Wow..these pies look so delicate and yum! I am baking some this weekend..and pinning as well. 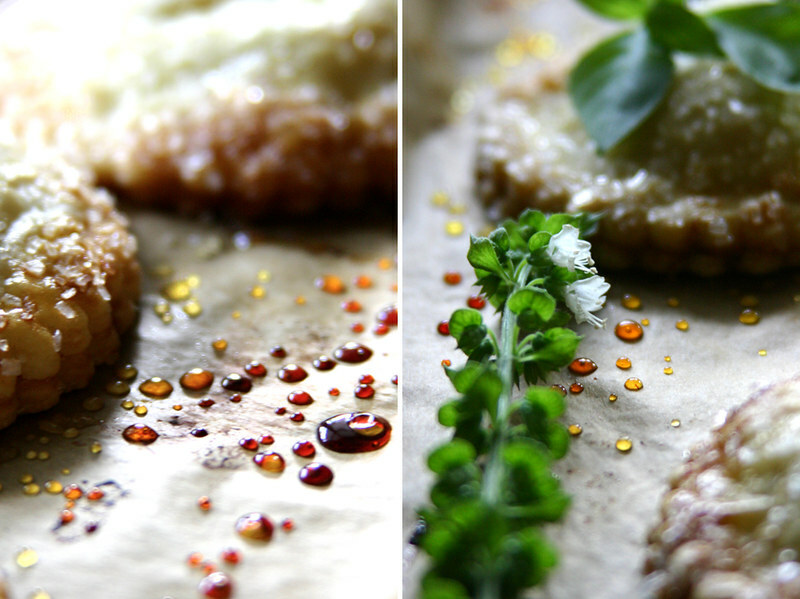 Amazing recipes, writing and photography!!! a visual treat!!!lovely.. These look amazing. I’m going to try these out someday ^__^… I wanted to ask you. What kind of camera do you use? 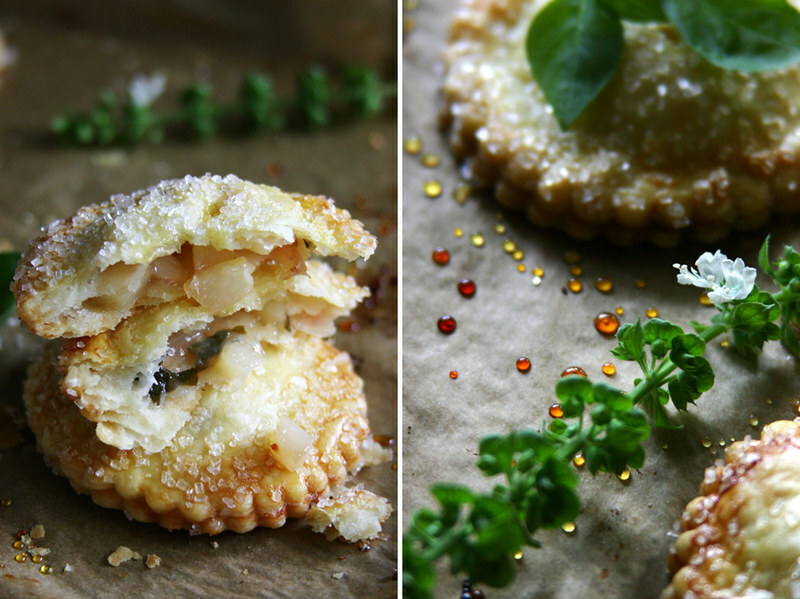 These pies look beautifully ethereal. You also write beautifully. PS I never wear an apron either! 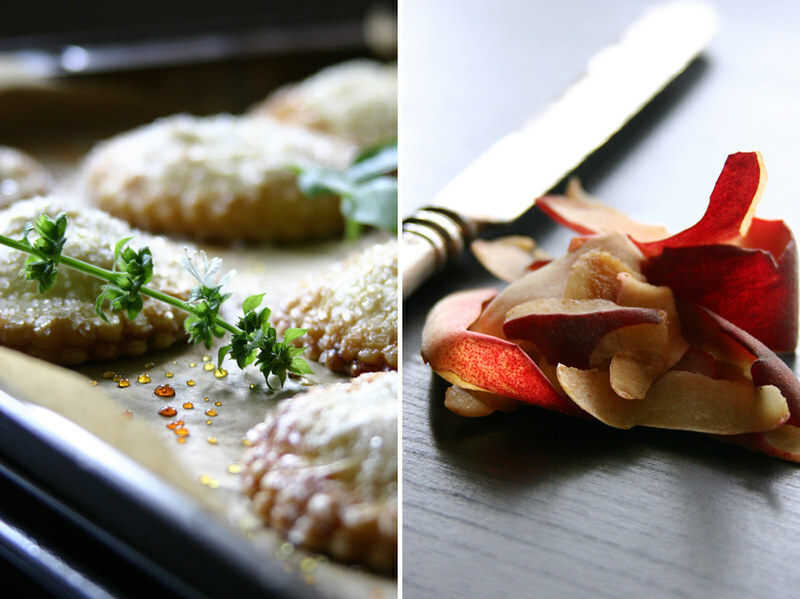 Pingback: Gather | White Peach, Rose + Basil Hand Pies | coterie. woohoo! hearing that people made one of my recipes is one of the chief joys of my life. hope you enjoyed them as much as I do! I’m sitting at my desk after work, dreading going out to my car to drive home through the “light snow”, with -2 windchill. As I read this recipe, drooling, I dream of next summer! Thank you for such an inspired recipe. I’ve followed you on various social medias for ages, but never sat down to actually peruse your blog. For shame. I’ve started from blog post numero uno, and THIS post’s pictures have been my favorite (so far). Beautifully done. Your work inspires me to no end. Every post filled with gorgeous language which flows so sweetly. Truly Beth your a jack of all trades but your writing brings life and fresh air in to my lungs. That first paragraph was like being on magical mushrooms somewhere far away. So grateful to have found your art. Hi, Scrumptious Sounding Pies, However, I’m Sooooo Thrilled By The Absolutely Gorgeous Photography! Hello! Just ran across this recipe, and I can’t wait to try it. I’d like to make it as a full pie. Would you suggest tripling or quadrupling the recipe, or would you adjust some of the proportions? I’m not sure! I’d compare the amounts to other peach pie recipes and go from there when deciding how much to make! I can’t wait to try one of your hand pie recipes. 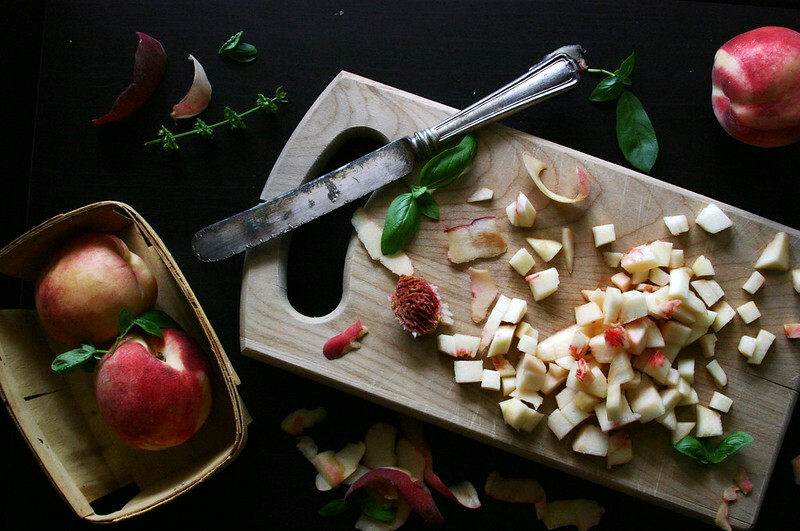 Right now, I have a bowl of gorgeous peaches and a bouquet of basil, calling to me. I enjoy making fresh fruit pies and my own pastry, however, I would really like to try the pastry you refer to (here and other recipes). Can you direct me to links to them. I have not been able to fine them. Thank you for a beautifully written and inspiring blog. And the most delicious looking photos/recipes!! Hi!! This sounds incredule!!!! Would this amount of filling be good to fill a whole pie instead?